Everyone I know this blog has nothing to do with technology, but you will understand how people don’t care about what this guy did, they just like and comment how handsome he is. The world is super weird!! When the police of the city of Stockton, California, arrested four individuals in an anti-gun operation, never thought that one of the criminals would be the focus of attention, nothing more and nothing less than his beauty. 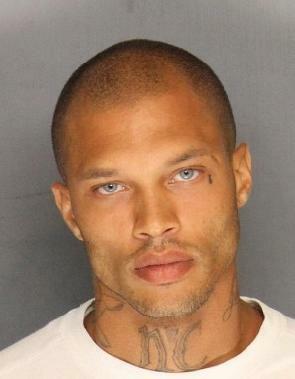 Turns out Jeremy Meeks, 30, revolutionized social networking when his police record was posted. That photo has been shared 718 times in the last hours. The man of dark complexion, blue eyes and features model captivated users of networks to forgot his offense. Police had reported that following a recent increase in crime in that area, took out warrants in 11 different places, according fox40.com. The record of the man on the Facebook page of the Police Department of Stockton has 18,001 likes and 4,357 comments. Due to a recent increase of shootings and robberies in the Weston Ranch area, the Stockton Police Department just completed a multi-agency Operation Ceasefire enforcement mission. Through an Operation Ceasefire analysis of the recent shootings, we identified a new active group in the Weston Ranch Area. Members of the Stockton PD Gang Violence Suppression Unit, Community Response Team, County Wide Gang Task Force, San Joaquin County Sheriff’s SWAT, Lodi Police Department’s SWAT, Manteca Police Department, Lodi Police Department, County Wide METRO Narcotics Unit, Federal Bureau of Investigation, United States Marshal’s Task Force, Alcohol, Tobacco, and Firearms; and the AB109 Task Force. 1300 block of Kimiyo St.
2400 block of Laguna Ct.
1200 block of Lloyd Thayer Cir. 4100 block of Degas Ct.
1900 block of Flatboat St.
4100 block of Seurat Ct.
4900 block of Tiller Ct.
• Jeremy Meeks, a 30 year old man, convicted felon, arrested for felony weapon charges. • Terry Bailey, a 22 year old man, convicted felon, arrested for felony weapon charges. • Juzri Coleman, an 18 year old man, arrested for felony weapon charges. • Joelin Coleman, a 44 year old man, arrested for felony weapon charges.